I could see why the pioneers on the Oregon Trail avoided this place. For miles in every direction, all I could see was black lava. It was dark, desolate, and dry. 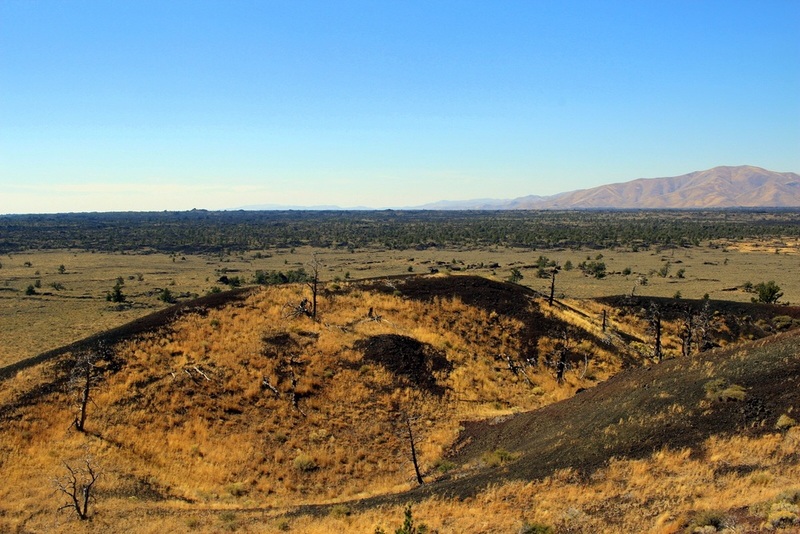 I was at Craters of the Moon National Monument, in the Snake River Plain of Idaho (AKA middle of nowhere). One of the beauties of this trip is that I cast my net widely, and decided to include national monuments and other sites operated by the National Park Service as destinations. We have 59 amazing national parks, but it's too easy to forget that we have hundreds if not thousands of other sites that are still protected by the National Park Service in some way. In fact, many of our national parks were once mere national monuments, before they were elevated to that grand "national park" status (I want to learn a little bit about how the designation system works--I don't really know how it all works). I began the drive over from Alta, Wyoming, a little bittersweet. I was driving away from the mountains--the location of several challenging days. As I proceeded west, all I could see were plains. Pretty soon, I saw a small mountain off in the distance. I forget the name of it, but the early pioneers also used this as a beacon as they headed west along the Snake River. I told the park rangers that I wanted to run easy today. Something with very minimal elevation gain (or loss). I'd spent 3 hard days in the mountains--climbing over 10,000 vertical feet--and my cold was getting worse. I needed an easy day. The ranger had just the trail for me: the Wilderness Trail. It was 4.5 miles out to the end on flat, soft, cinder, and very little elevation change. This was also in the Craters of the Moon Wilderness Area--the first designated wilderness area in our national park system. I'd have unrivalled solitude back here. On my way over to the trailhead, I marveled at the lava that surrounded me. There were also cones and mounds that had sprouted out of the earth. I was glad I wasn't climbing any today. I reached the trailhead, and read up on everything I needed to know. With my cold, I wanted to stay hydrated. I topped up my 100-oz Camelbak again, even though at 1 p.m. it was only in the high 70s--relatively cool for an inhospitable place like this. And just like that, I was off! 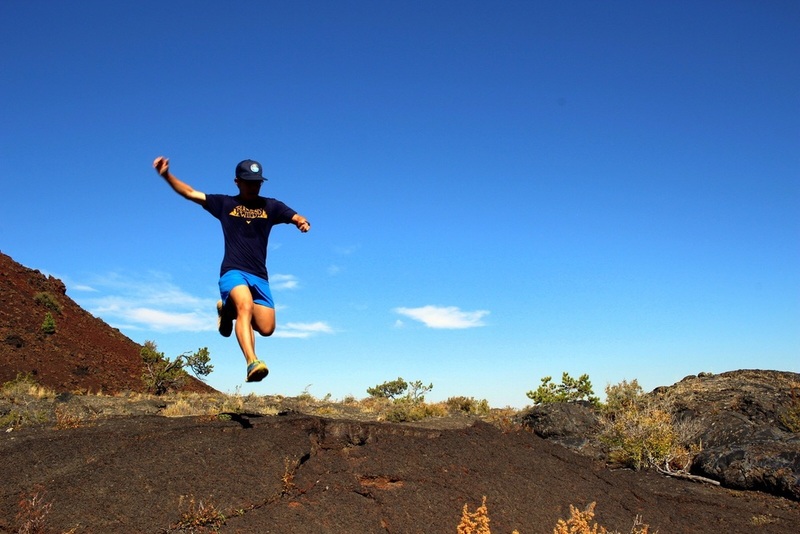 The beginning of the run had me go into a pretty thick lava field. This was part of a shorter loop that I could see many families liked. 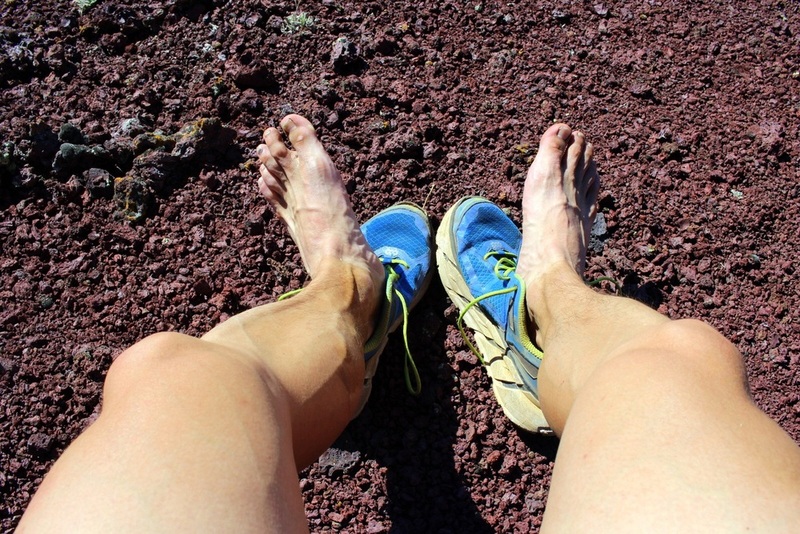 It was definitely what one would imagine when one thinks about running through a lava field. Pretty soon, though, the landscape changed. The path was wide cinder--almost like a red carpet. It sure felt like one; the cinder absorbed my footstrikes and the absence of any obstacles made for easy running. This was just what I needed after several hard days in the mountains. I was able to pick up a solid, steady pace--just over 9-minute miles. I followed the red carpet out into the wilderness. That red carpet disappeared from time to time. Following the trail was only slightly harder. But there were cairns to follow, and the path was pretty clear. This wilderness area was certainly not what I imagined when I thought of Craters of the Moon. I saw very little black lava. But the feeling of solitude was immense. I was all by myself in a vast desert-like environment. Every now and then, I'd see patches of black lava, which reminded me where I actually was. After over 4 miles, I was confused by why I hadn't reached the end of the trail. Had I gone off track again? I rounded a bend and saw a cinder mound off ahead of me. I figured that that was Sentinel Butte, the end of the marked Wilderness Trail. As I got closer, I realized that this must be it--the mound rose up out of the plain, providing a perfect vantage point for a sentinel to see miles in every direction. I noticed a human-trodden switchback trail up the butte. I figured I'd follow it up. It was steep and slippery, the lava rocks were like little ball bearings. Every step I took, my foot would slide back halfway down the mound. One step forward, half step back, one step forward, half step back. Here, you can kind of see the incline. The view from the top was pretty spectacular. I found a father-son duo resting at the summit as well. What was particularly pleasing about the view was the juxtaposition of all the different colors and environments. 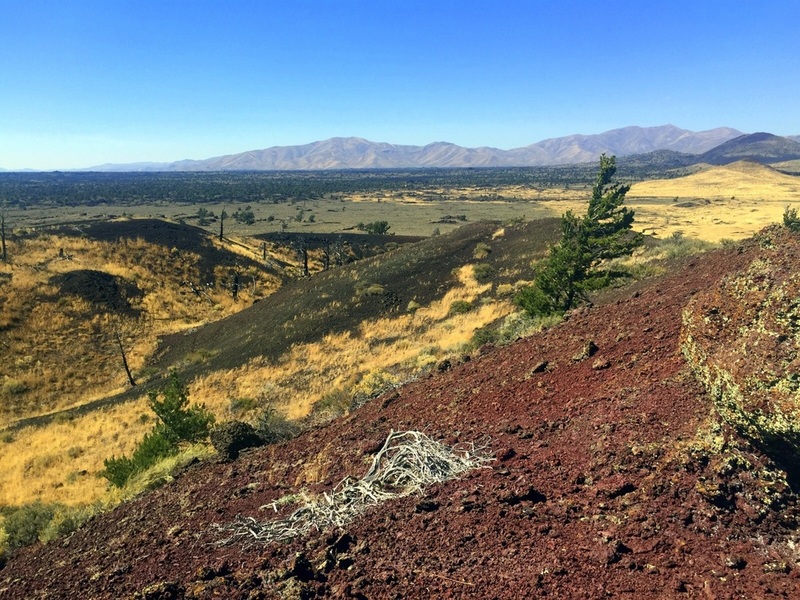 You had red cinder right in front of you, black lava interspersed with yellow and brown grasses, occasional greenery, the brown mountains off in the distance, and the clear blue sky above. Really, it was unique. My feet took a break too. On the way back, I grew tired. It was getting hot. I began rationing my water. I drained the 100-oz reservoir right before returning to the trailhead. The trail had been nice and flat. But I was beat. I wasn't about to leave Craters of the Moon just yet. I'd been told about the caves that one could explore. I decided to take my headlamp and head into Boy Scout Cave. It was pretty scary in there. There was no lighting except the light that you brought in. And there was no guide except a railing that you could hold onto as you passed through the initial crawl space. Inside, I looked around, like a cave explorer, using my headlamp for light, and also occasionally my iPhone. There were 4 other people inside with me. I led the way. It was also very cold inside. We could see ice formations on the cave floor. Slippery! My hands began to get numb. Certainly, this was a nice respite from the dry heat on the surface. After reaching the end, we turned around and headed to the surface. It was hot--really hot. Just outside the cave entrance. And then, I was gone. I had many miles to cover. 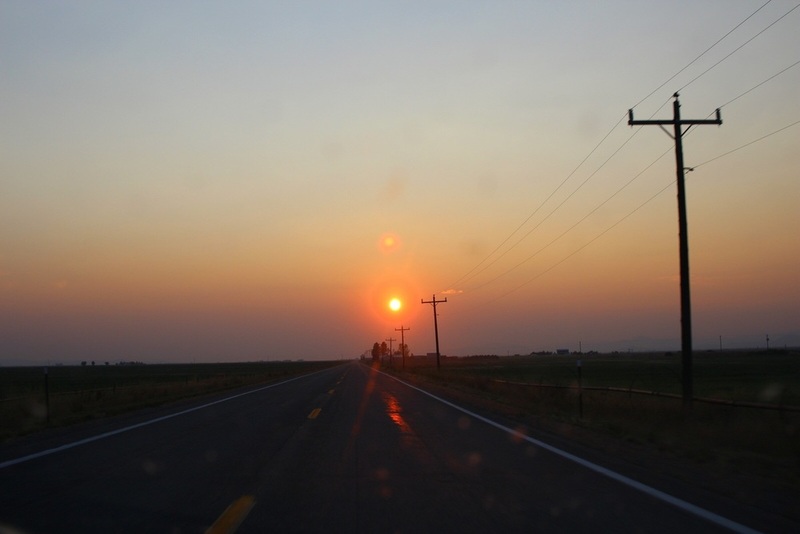 I drove straight west on route 20 straight into the setting sun. It was somewhat monotonous, but I enjoyed tracking the sun as it set off in the distance. Eventually, it grew so red that I had to pull over and take a photo of it with my zoom lens. And so ended another beautiful day exploring our national parks.